Rated together with the Russian classic Battleship Potemkin as the joint best black-and-white picture ever made, this Alfred Hitchcock horror comic classic was nominated for four Oscars. Hitch himself rates it as a comedy (?!) 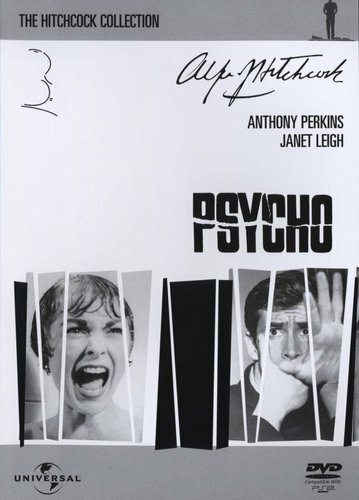 because less than halfway through the story, the lead character Marion Crane (Janet Leigh) – on the run for having stolen $40,000 from her boss – meets an untimely end – thus leaving the audience with nobody with whom to identify! And remember, $40,000 was a great deal of money back in 1960! The director then manipulates us into rooting for the weird young motel manager Norman Bates (Anthony Perkins) who appears to be dominated by his mother. Also, the superb editing tricks our minds into believing we’re actually seeing violent footage that for most part isn’t actually there. I intend to honour Hitchcock’s plea: “Don’t reveal the ending; it’s the only one we’ve got!” The only pity about this one is that it spawned a whole spate of similar though vastly inferior movies from filmmakers who were nowhere near to Hitch’s class! The cast also includes John Gavin (once a candidate for the James Bond role! ); Vera Miles, and Martin Balsam. 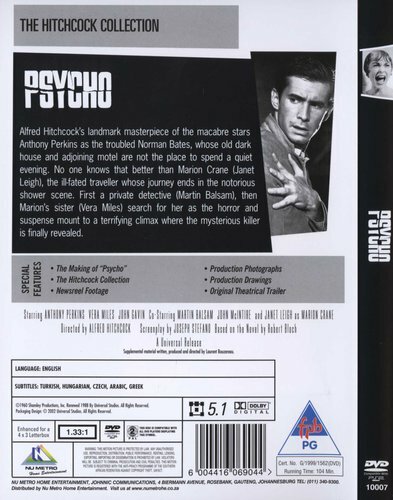 Anyone who loves classic horror movies with great character development. Black and white. Beautifully shot. Alfred Hitchcock masterpiece. Highly recommend the movie for anyone who loves the classics.